Enjoy roasting your hot dogs and marshmallows in a whole new way with a roaster that looks and feels like a fishing pole. Conveniently pack up your fishing poles in a ready-to-go bag and secure them in the stand when not in use. 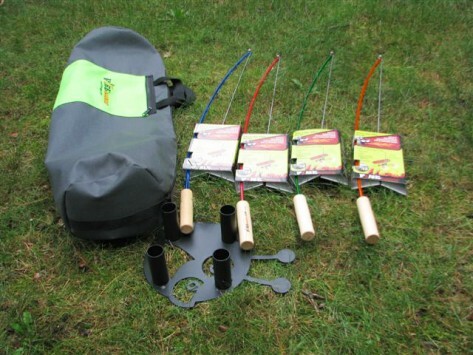 Set includes 4 Fishing Poles, 1 Pole Bag, and 1 Bugg Stand. Dimensions: 34" x 1" x 2.5"
Dimensions: 32" x 12" x 0.5"
Dimensions: 10.5" x 3" x 8.5"
Wow. These are a blast!! This product is awesome. Get the entire set and keep the whole family happy. Formerly a landscape designer, Bob is always looking for family-friendly ways to fire up the fun in outdoor spaces. He and Tara had kids in mind when they included a built-in safety mechanism to control rod swing. Perfect for backyard firepits, beach bonfires, and camping trips, you can roast up to four marshmallows or two hot dogs per pole. We’re willing to bet that the kids will each want a pole of their own.